Marc Reid imagines the logical evolution of the Maersk shipping company (and corresponding LEGO sets perhaps?) 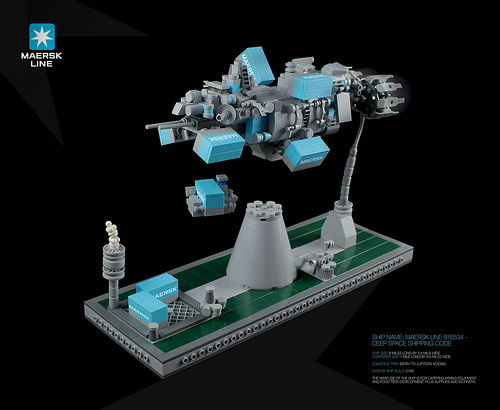 into the far future with the MAERSK LINE 976534 SPACESHIP. According to Marc, each shipping container would be a mile long – which by my calculations is large enough to ship an entire shipping company! I love the idea that the even as the technology and environments change, the Maersk containers would retain their iconic look over the centuries. In fact, I think it’d be cool to see other builders interpretations of the Maersk line in increasingly distant periods in the future. Get to it, my friends! That sounds like a great contest idea. I’m not sure if you do them, but you totally should. This is an awesome ship but also a great idea. I’m always intrigued by what people think today’s objects will be like in the future.